The beta mode will include natively supported apps for both iOS and Android. Spotware Systems, the developer of the cTrader platform, has announced the soft launch of its new cTrader mobile applications in beta mode testing. The new mobile apps will be available in native format for both Android and iOS devices. 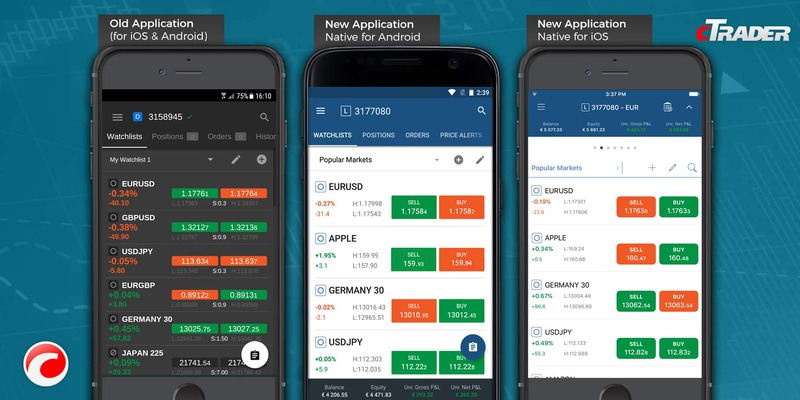 The development of native mobile apps on cTrader is noteworthy as it will eventually be displacing the existing version of the platform that has been readily utilized by brokers since its release in 2013. The launch of a new Beta mode will also include several new innovative features for users, following more than a year’s worth of development. “This is a major milestone for Spotware. The fact that we are able to show something tangible to the world after more than 12 months of development is a great feeling. Everyone is feeling very proud today. The best part is, now we have these new applications, we can continue to develop them and add new features for mobile faster than ever before,” explained James Glyde, Chief Commercial Officer for Spotware Systems, speaking exclusively to Finance Magnates. This includes the deployment of new fluid charts with pinch-to-zoom functionality, reduced launch time, streamlined navigation through application, market sentiment indicator added to mobile, and links to all news from mediums such as Yahoo Finance, MSN Money, and Google Finance, etc. Moreover, the new native user experience will also include detailed trade statistics and the addition of five new supported languages, such as Thai, Czech, Slovakian, Slovenian, and Serbian. Individuals interested in testing the new beta version of cTrader can access the apps via the following links across the App or Play Store. The applications will be made available for everyone to test, with Spotware actively seeking feedback for the Beta version. The new version will be available in Beta mode for the foreseeable future – this will ultimately pave the way for its roll out to brokers for live trading, including all cTrader’s brokers at no extra cost. In particular, the new Beta applications build on Spotware’s existing efforts to help continuously upgrade its platform. Back in July, the group also implemented a new order type to the platform, including a Stop Limit Order. The order type helped add more precision, ultimately setting a limit on the price at which a stop order is triggered. As a result, negative slippage was effectively eliminated, enabling traders to better execute their strategies. Spotware will also be in attendance at the 2017 London Summit hosted by Finance Magnates on November 14-15 at Old Billingsgate. The trading software developer will be exhibiting their new mobile applications at booth #54 during the event.